Temagami First Nation’s Administration Office is located on the Bear Island Indian Reserve, which is one square mile of land, mostly rock, in the middle of Lake Temagami. The Families of the Temagami First Nation have occupied the lands and waters in the Temagami area as stewards for thousands of years. The Temagami First Nation is the Body Politic of the 800 Teme-Augama Anishnabai, who are presently recognized as Indians under the Indian Act of Canada. 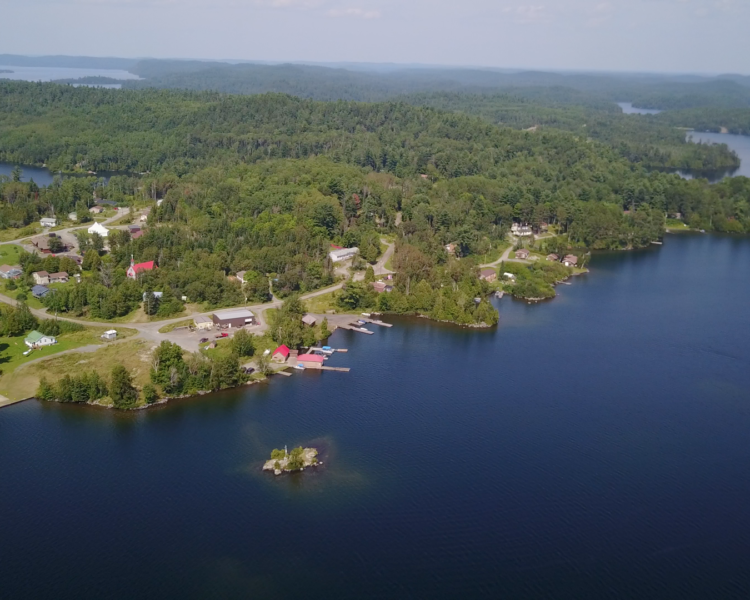 The Bear Island Indian Reserve community, which includes 250 permanent residents and the government institutions of the Temagami First Nation, preserves the integrity of Teme-Augama Anishnabai as the stewards of n’Daki Menan. Anthropologists have stated that Bear Island was likely one of the first places that humans (Teme-Augama Anishnabai Ancestors) inhabited in the Temagami area. They say this because the Tower Hill is one of the highest points of land on Temagami Lake. The grandparents of the present day Temagami First Nation began to reside on Bear Island during the summer, when the Hudson Bay Post was established in 1872. Chief Tonene approached the Indian Agent and asked for a reserve in 1877. The Federal Government recognized that the Temagami Indians were missed in the Robinson Huron Treaty of 1850 and surveyed a reserve in and around Austin Bay. The Ontario Government refused to support the creation of a reserve in Austin Bay. So began the Teme-Anishnabai struggle for justice. A church was built on Bear Island in the late 1800s and a school was built shortly after and the children began to attend school in the summer. Fearing forest fires, the issue of a reserve for the Temagami Indians became a serious concern for the tourist and forestry industry and in 1945 Ontario agreed to sell Bear Island for $3,000.00 to Indian Affairs. In 1970 at the request of the Chief and Council Bear Island became an Indian Reserve by an Order in Council of the Minister of Indian Affairs. The struggle for justice regarding lands for Temagami First Nation continues. Three friends search for a ghost in an abandoned school. An Indigenous woman seeks guidance when she loses her way. Youtube vloggers try to come to terms with the death of their friend. A poetic rumination on friendship. Three fun animations in a row! An old wrestler (Old Man Jenkins) goes back in time to see his old pal DJ Denton and battle his arch nemesis', Sumo Zach and Muscle Mazzy.